Do you recognize the name? This worthy saint is better known for the town in which her father’s palatial estate was located. And while she is often paired with a man named Francis, this woman was a force to be reckoned with during her life. 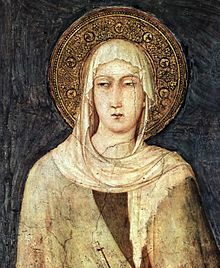 Clare of Assisi is one of the better-known saints in our Communion. Books could be written, but I thought it better to touch on her aspirations of following her friend into a deeply radical Christianity. In gathering women to follow this radical holy life, Clare had two great obstacles. It was extremely difficult in 13th century Italy for women to live as Francis and the brothers lived: begging and poor and without a home of any sort. Clare solved something of this by rejecting offers (even from Pope Gregory IX) to be dispensed from a vow of poverty. Clare’s response was, “I need to be absolved from my sins, but not from the obligation of following Christ.” And so the Privilegium Pauperitatis was granted. She and her sisters lived within walls in a similar way as those Franciscan men lived outside: sleeping on the ground, abstaining from meat, and engaging in manual labor. I don’t know if Clare knew of the various movements of the Beguines and other women in northern Europe who declined to conform to expectations for women religious. Perhaps life in a home in a city would have been unsatisfactory to women who longed for the itinerant life of Francis. Still, some bishops brought pressure to bear to conform Clare and her women to a monasticism more in the style of Saint Benedict. Relationships seem never to have gotten to the breaking point other women leaders experienced. Clare was a well-regarded figure in her day. Though Poor Clares remained in cloisters for centuries, the Franciscan charism emerged in new ways over the past century or so. In 1256, Clare was declared a saint–only three years after her death. Her reach is still strong, healthy, and fruitful today.